1988 Press Photo Hard-hitting team of Fox Broadcasting's "The Reporters." 1988 Press Photo Fox Broadcasting journalistic team for "The Reporters." 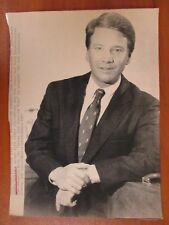 1988 Vintage Photo journalist Jim Paymar anchors FOX TV show "The Reporters"